Notice is hereby given that the Borough of Columbia, 308 Locust St, Columbia, PA, Lancaster County, Pennsylvania, will be holding an on-line auction of surplus items. 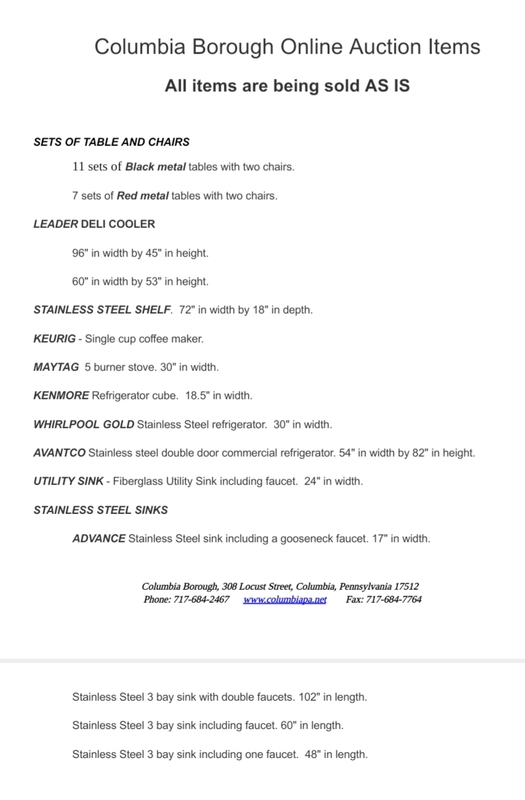 A complete list of items can be found on our website, www.columbiapa.net or a copy may be obtained at the front desk between the hours of 9:00 am and 4:30pm. All items may be inspected at the Borough of Columbia. The auction begins May 9, 2018 and ends on May 23, 2018. If you are a person interested in bidding please log on to www.municibid.com create an account, follow the instructions and bid on any of our items listed under Pennsylvania, Columbia Borough. At the end of the auction the item will be awarded to the highest bidder. The Borough of Columbia expressly reserves the right to reject any and all bids. WHERE IS THE 4 stoves every thing else is from the market house .